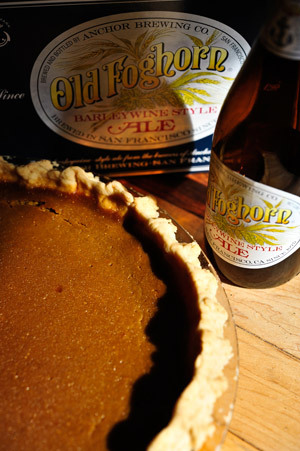 Anchor Brewing Co., Beer Advocate, Recipe, Sierra Nevada Brewing Co.
What would Thanksgiving be without pumpkin pie? For this recipe, I wanted to make a special pumpkin pie, one with lots of flavor, showcasing the pumpkin while also highlighting the fall spices. 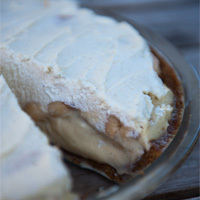 Here, a Bourbon Pie Crust adds complexity. Then to create a Anchor Brewing Old Foghorn Barleywine Pumpkin Pie, I wanted to showcase the flavors of this delicious beer style. 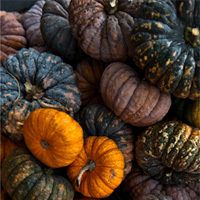 Mixing crème fraîche with an English-style Barleywine that has notes of caramel and hops adds a touch of sweet and sour to the pumpkin, and builds a delicious pie filling. 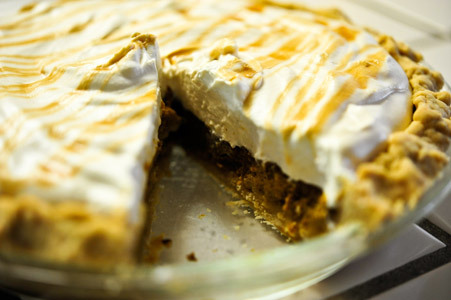 To top this recipe off, a Sierra Nevada Bigfoot Maple & Malt Caramel sauce sweetens a whipping cream and is laced over the pie slice, really bringing it home. I would suggest buying new and fresh spices for this recipe if what’s in your cupboard is more than two years old. Fresh spices will add a wonderful bright note to the finished pie! Hope you have a wonderful Thanksgiving! 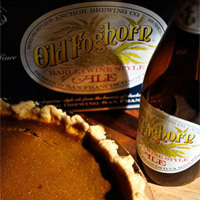 Old Foghorn Barleywine Pumpkin Pie infuses Anchor Brewing's Old Foghorn Barleywine into a pumpkin pie, with a Bourbon-infused pie crust and a malted caramel whipping cream. 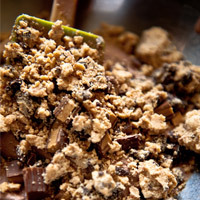 In the bowl of a food processor, add the flour, sugar and salt; pulse several times to mix the ingredients. 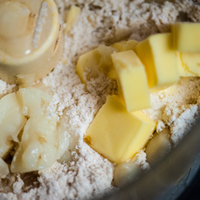 Add the cubed butter and shortening to the flour mixture. pulse the processor several times until the entire mixture has a sandy texture, with small bits of butter/shortening no bigger than the size of the grains of malt. 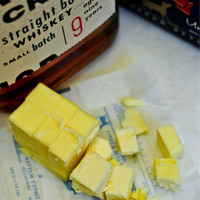 With the motor running, pour the chilled bourbon into the flour/butter mixture, letting the dough almost come together. Turn off the food processor and check the consistency of the dough. It should hold together if a handful is squeezed. 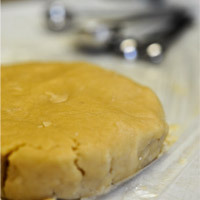 Remove the dough, place on a piece of plastic wrap and form a disk that’s about an inch thick; wrap and place into the refrigerator for 30 – 60 minutes or up to three days (if making in advance). This will let the bourbon hydrate the flour, while the butter and shortening are re-chilled, making the dough easier to roll out. 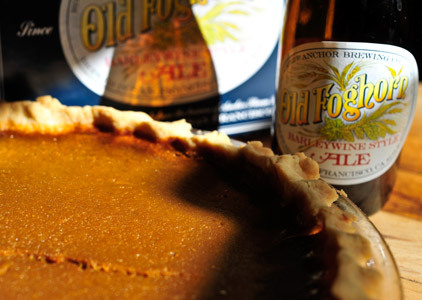 When ready, remove the pie dough from the refrigerator; unwrap and place on a lightly floured work surface, and use a lightly dusted rolling pin or a chilled 22-ounce bomber. If the dough is too hard to roll out, let sit for 5 minutes to soften. Roll the dough out, flipping it over a few times, lightly dusting the surface with a thin coat of flour to prevent sticking. Once the dough is rolled out to a 14-inch-diameter circle, check for an even thickness across the surface. This will fit into a 9-inch deep-dish pie plate. 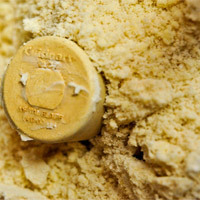 Take an edge of the dough (a scraper can be used to help), wrap it around the curve of the rolling pin/bottle and continue to roll the dough lightly around the pin/bottle, then transfer it onto the pie dish (not greased). Then unroll the dough into the dish, centering it and letting any extra hang over the edge. Lightly press the dough into the bottom and up the sides of the dish. Trim the sides of dough to about an inch of the rim of the pie plate. 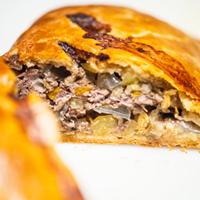 Fold the extra dough under itself, creating a thick rim that will make crimping the edges easier. If there are any cracks or the dough seems too thin, use the extra dough to make a patch. 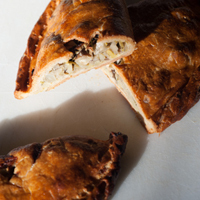 Crimp the edges by either pinching the dough around in a circle, or by using two fingers on one hand, placing a finger from the other hand in between to make a small wave, and continuing around the perimeter. Place the pie dish into the refrigerator for at least 30 minutes to re-chill. This will prevent the crust from shrinking while it cooks. Preheat the oven to 350°F | 177°C. 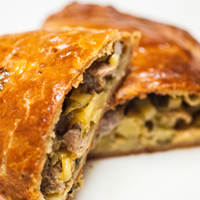 Lightly prick the bottom of the dough with a fork to prevent the crust from bubbling up as it cooks. Place into the center of the oven and bake until it’s a light blond color, about 25 minutes. Let the pie crust cool before adding the filling. 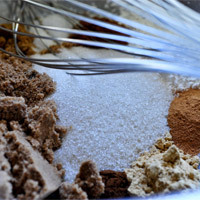 In a medium-size bowl, measure out the cornstarch, cinnamons, ginger, nutmeg, salt, clove, brown sugar and organic sugar. 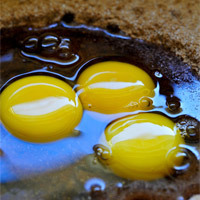 Using a whisk, blend well and add in the cracked eggs, beating until frothy and fully incorporated. 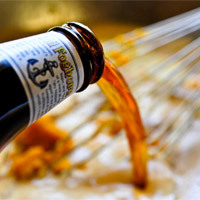 Add in the Anchor Brewing Co. Old Foghorn Barleywine , crème fraîche (or sour cream) and pumpkin purée, blending until smooth. Pour the filling into the cooled, pre-baked Bourbon Pie Crust, tapping lightly on the counter to remove any bubbles, and place into a preheated 325°F | 163°C oven for 55 - 60 minutes. The filling should be set, but not too firm; a light shake to the pan should have a little wobble to it. Remove from the oven and let cool for at least 2 hours to set properly before serving. In a large pot, add the Sierra Nevada Brewing Co. Bigfoot Barleywine, maple syrup and malt powder. Place the pot over a medium flame and whisk to dissolve the malt powder. As the syrup comes to a boil, it will foam up; whisk to deflate the bubbles and prevent a boil-over (another reason to use a large pot—for the extra volume). Let the syrup simmer (adjusting the heat) for 15 – 20 minutes, or until a thick consistency is reached and the temperature is 240°F | 116°c. Remove from heat and let cool. In a metal bowl, place the ice-cold cream and 2 – 3 tablespoons of the caramel to sweeten and flavor it. Using a whisk or electric mixer, whip the cream to a semi-soft peak. Wrap and chill if not using right away. Pour the remaining caramel into a squeeze bottle for garnish, and refrigerate. 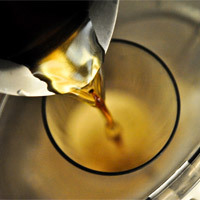 Any extra caramel can be used over pancakes, waffles, in coffee as a sweetener or over ice cream as a sundae topping. 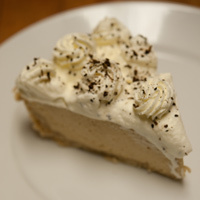 Option 1: Slice the cooled pie into eight pieces and place a slice onto a plate, spooning some of the Bigfoot Maple & Malt Caramel-Infused Whipping Cream across the wedge, then drizzle some of the caramel across the plate as a garnish. Repeat with remaining slices. 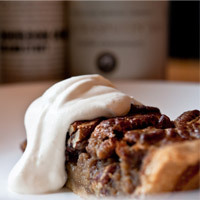 Option 2: To make a Pumpkin Crème Pie, pour the whipped cream on top of the baked and cooled pie surface. 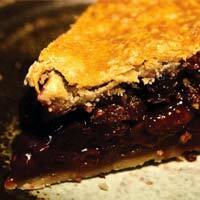 Using a spatula, spread the cream evenly across the pie, forming a bit of a hill in the center. 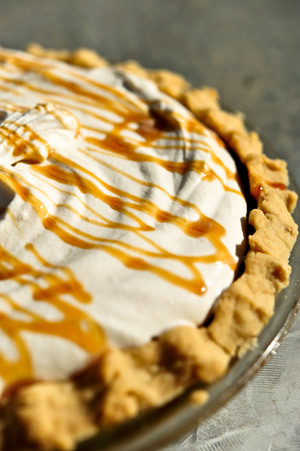 Now, using the squeeze bottle, lace the Bigfoot Maple & Malt Caramel back and forth over the pie, creating a pattern. This can be made up to six hours in advance. 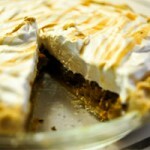 Slice the pie into eighths, and serve each slice with an extra drizzle of the caramel.